Finding the perfect dress for your infant is a delightful experience. We, at Neiman Marcus, ensure that your bundle of joy is always at her adorable best with our designer baby girls’ clothing. 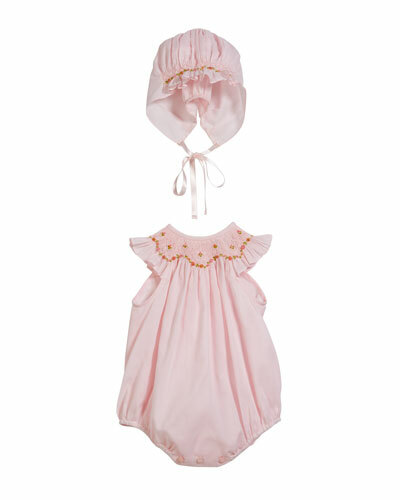 Browse our diverse selection to find a variety of fashionable newborn girls’ clothing. For playtime and sleep, our playsuits, nightgowns, and footie pajamas are ideal. Looking for warm baby girls’ clothing? We have jackets and sweaters to keep them cozy. 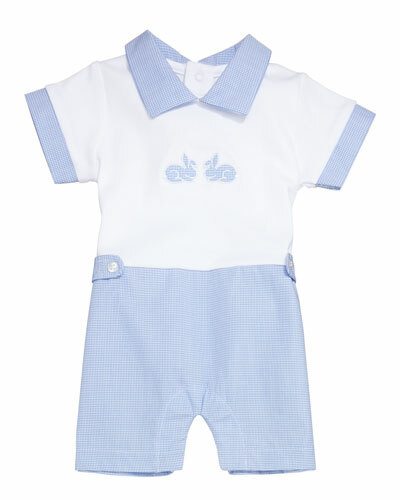 We also carry cotton jersey coveralls for baby girls in cute designs. If you are looking to gift your friends for a baby shower, our newborn girls’ outfit and layette sets will give you tons of choices. 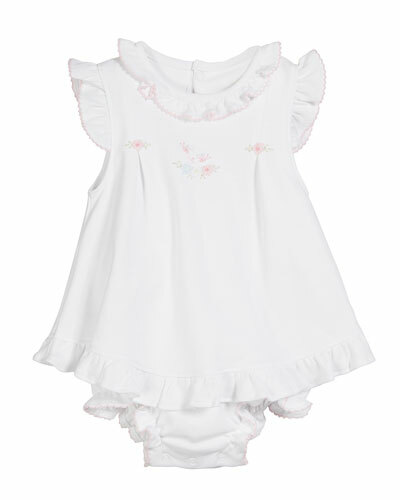 Our baby girls’ clothing is made from soft fabrics to keep your newborn girl comfortable at all times. 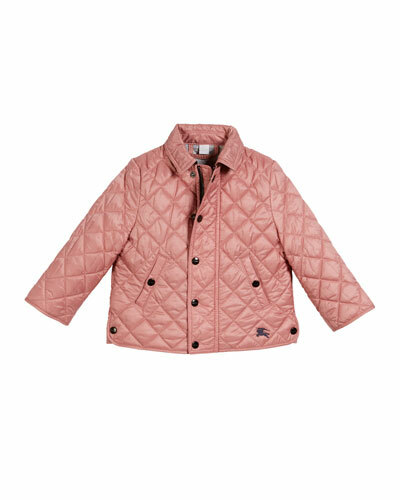 Shop Neiman Marcus for a fine selection of designer baby girl clothing. Flowers By Zoe dress in allover tie dye pattern. Smocked, off-she-shoulder neckline. Short, ruffle sleeves with adjustable spaghetti straps. Cold shoulders. Ruffle hem. A-line silhouette. Rayon. Imported. 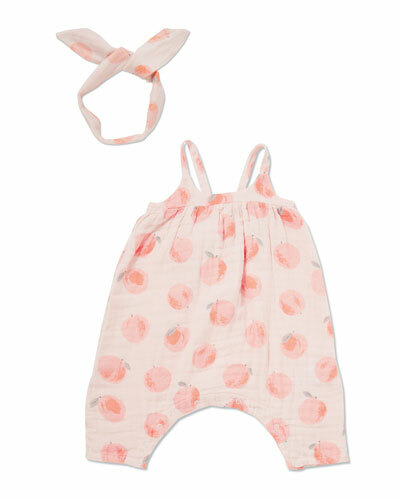 Joules "Nell" two-piece outfit set. Solid dress with tonal eyelet trim at cuffs and hem. Round neckline; keyhole-button back. Shirred, Empire waist. Multicolored dot confetti print leggings. Elasticized waistband. Dress: cotton. Legging: cotton/spandex. Imported. Kenzo sweatshirt dress, featuring signature tiger adorned with flip sequin Santa hat. Crew neckline; snaps at left shoulder. Long sleeves; banded cuffs. A-line silhouette. Relaxed fit. Pullover style. Cotton. Imported. Moncler two-tone dress. Peter Pan collar with bow detail. Short sleeves; logo patch at left sleeve. Button placket front. A-line silhouette. Attached bloomers. Cotton/spandex. Made in Portugal.